"The Silent Eagle demonstration flight validated our initial engineering design approach"
ST. LOUIS, July 9, 2010 -- The Boeing Company [NYSE: BA] Silent Eagle flight demonstrator aircraft F-15E1 completed a successful first flight on July 8 from Lambert St.
Louis International Airport. During the 80-minute flight, F-15E1 opened and closed its left-side Conformal Weapons Bay, which contained an AIM-120 Instrumented Test Vehicle (ITV) missile. The ITV was not launched. 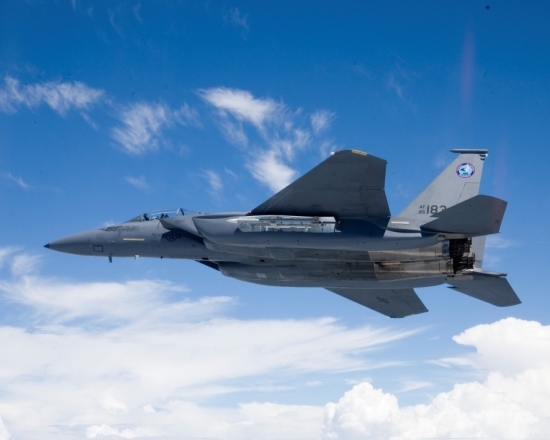 "The Silent Eagle demonstration flight validated our initial engineering design approach," said Boeing F-15 Development Programs Director Brad Jones. "Our intent was to verify all systems are operational in a flight environment. This flawless flight allows us to move into the next phase. In the next couple of weeks, we will ferry F-15E1 to the test range and launch an AIM-120." "Everything about the flight went according to plan," said Boeing F-15 Chief Test Pilot Dan Draeger. "We saw nothing unusual during the flight, and we cleared the desired flight envelope needed to fire the missile at the test range; that is pretty much unheard of on a first flight." The Silent Eagle is an innovative design solution developed in response to international customer requirements for a cost-effective, high-performance fighter aircraft to defend against future threats. The F-15SE offers unique aerodynamic, avionic and Radar Cross Section reduction features that provide the user with maximum flexibility to dominate the ever-changing advanced threat environment. The aircraft's Conformal Weapons Bays can carry a variety of air-to-air missiles and air-to-ground weapons.